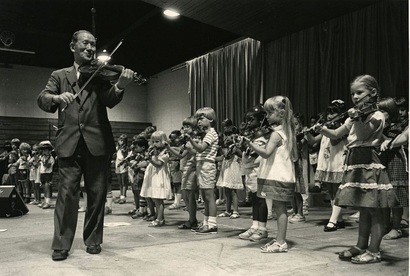 The Suzuki approach to teaching music grew out of Dr. Shinichi Suzuki’s belief that all children can develop the ability to play instruments beautifully, just as all children learn to speak their native languages with ease. Often called “the mother-tongue approach,” this method focuses on the importance of daily listening to the Suzuki repertoire and repetition as the tool to mastering skills. Listening to the same musical pieces each day is similar to hearing the same words and expressions when learning one’s native language. Children discover and start imitating sounds before they are introduced to written symbols; they talk before learning to read and write. The same process can be used when teaching music: listening to and playing melodies precedes learning to read musical notation, if only for a short time. After students become familiar with the geography of the instrument and master basics of playing technique, the ability to read music comes more easily. Suzuki Instruction is the only method offered to children 7 years or younger. Parents take on an active role in Suzuki instruction. They attend all lessons, take careful notes, and become at-home teachers, where they create a positive and nurturing musical environment, play the Suzuki C.D. every day, and guide children through practice sessions at home. Suzuki students learn by ear and daily listening is the foundation of the Suzuki approach. Students listen daily to recordings of the Suzuki repertoire and of good music in general. The more a student listens to the recordings, the easier he or she will learn. The Suzuki philosophy focuses on building skills and developing technical proficiency on the instrument. Review and continuous maintenance of learned pieces is crucial – students use review pieces to build, improve, and polish technical skills. The focus is always on how students play rather what piece they are learning. Group classes are an integral part of Suzuki instruction. Suzuki students are required to enroll in the Department Classes. Department Classes reinforce skills that are taught in the private lesson. They provide another opportunity to improve posture, tone, and technique. Click here to learn more about Department Class objectives. We offer Suzuki instruction for voice, piano, guitar, violin, viola, cello, and flute. For families who need help choosing the right instrument, we recommend attending one of our monthly All-School Recitals where children will hear a variety of different instruments. Our Instrument Primer class offers weekly introductions to all of the instruments. Also, you can arrange to observe private lessons and group classes on different instruments to get to know them a bit better. Taking your time to choose the right instrument will have its benefits – it’s much easier to motivate children to practice on the instrument they liked and chose. Observe at least three of another student's lessons with your child. Attend a Suzuki Basics for Parents session. Complete registration at least 72 hours prior to your first lesson. To begin the enrollment process or for more information about Suzuki lessons, please call us at 312.738.2646. Observe at least one Department Class of your chosen instrument. Read Nurtured by Love by Dr. S. Suzuki. Purchase the Suzuki CD for your chosen instrument and start the habit of daily listening. Suzuki CDs can be purchased and downloaded from iTunes. Note: Suzuki students are expected to enroll in both weekly private lessons and a Department Class. Tuition - $15 for one session, per family (more than one parent or guardian may attend). This fee will be credited to your account upon enrollment in the Suzuki program.